When I was a kid, I didn’t know what genres were. I just read books. I read a lot of books. I remember reading Frank Herbert’s DUNE for the first time, and I will never forget it. I felt my brain stretch with impossibilities of how lives could be lived and stories could be told. I didn’t even know the phrase “science fiction.” I just knew I loved that book. 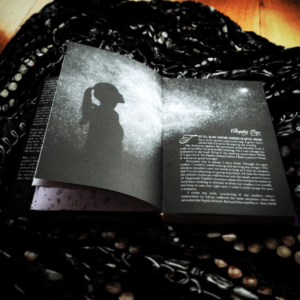 Around the same time, I read MAMA DAY by Gloria Naylor, in which a conjure woman called lightning down from the sky, and typing those words now still raises the hair on my arms in the very best way. Both of those books are on the list of ten books that will travel with me to a desert island were I ever to be so blessed to have time away from my kids. Science fiction and fantasy, and books with the elements of both, can sometimes be considered low-class literature. Other times, they are the highest—after all, no one would call MAMA DAY anything other than high brow. But still, to this day, we debate the merits of “genre fiction.” It is relegated to the back of the bookstore, if it is in the bookstore at all. It often appears in mass market paperback—rarely in hardcover or trade. If it does appear as such, it’s because the author (Stephen King, J.K. Rowling) is the exception, not the rule. Enter STARSWEPT by Mary Fan. Mary Fan not only writes Science Fiction, she writes for small presses, and she hustles her own books at cons. I’m am completely and totally impressed by Mary Fan. 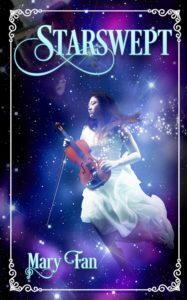 In STARSWEPT, Iris, our heroine, studies music—she’s a viola prodigy—at a school for gifted artists on an Earth that has grown desolate with abject poverty caused by income disparity. The students compete to be sponsored by a remarkably humanoid alien race who discovered Earth decades before, the Adryil. Although the Adryil have advanced beyond humans technologically, they do not have the arts, and they covet them. But what seems like an innocent trade—a sponsorship and a luxurious life on Adryil in exchange for performing one’s art—turns out to be something far more sinister. Iris begins to learn of this dark side of things when she meets an Adryil boy who sneaks into her school and gives her a communication device, and they begin a friendship across the stars. What will she uncover, our humble viola player? What will she discover when she finally makes it to Adryil? More importantly, could STARSWEPT be any more gorgeous? In case you were wondering, Fan has a degree in music composition from Princeton, so she has the chops to write a book about music and space. And then, the cover—let’s discuss the cover. Below is an outtake from the photo shoot from Instagram. That’s Fan’s sister, Iris, in a swimming pool. Furthermore, this is a gorgeous book. As you can see below, the hardcover edition (there IS a hardcover edition) has incredible illustrations and paper that is buttery soft. Fan took pains to make reading an enjoyable, tactile experience. Genre fiction? Whatever. Get swept away: Music. Interstellar travel. Complex politics. What’s not to love? 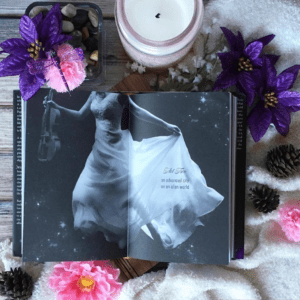 Buy STARSWEPT on Amazon, Kindle or Hardcover. Katie is a novelist, freelance journalist, and erstwhile law professor in Chapel Hill, North Carolina. 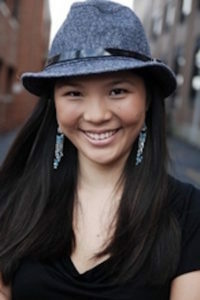 She is the author of the Hollywood Lights Series, which includes ENTANGLEMENT (2015), LOVE AND ENTROPY (2015), CHASING CHAOS (2016), and HOW TO STAY (2017), all from Blue Crow Books. With Raven Books, she is the author of LIFE OF THE MIND INTERRUPTED: Essays on Mental Health and Disability in Higher Education (2017). I felt that way too…as a young reader. I just knew what I liked and read those kinds of books all of the time.